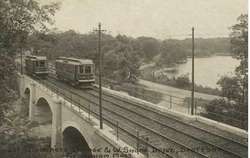 From the turn of the century until the mid 1940s, street railways connected Stoneham with other area towns and to the City of Boston. The Middlesex Fells was a particularly popular destination for riders from Boston who made day trips to stops along the shores of Spot Pond. Some tracks can still be seen in the Fells, although large parts were dug up for the construction of I-93 during the 1950s. ﻿Bay State Street Railway Company and later the Eastern Railway ran lines through the Fells all the way to Haymarket in Boston, Riders could also take branches that ran along Montvale Avenue and along Franklin, Marble, and Elm Streets. . 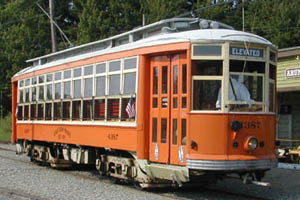 The Seashore Trolley Museum in Kennebunk, Maine holds Streetcar No. 4387, a Bay State Street Railway car built in 1918. 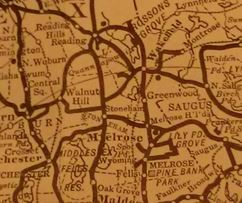 That particular car ran on the route from Sullivan Square and Haymarket to Stoneham until the line was closed in 1946.